Once upon a time in Westphalia, in the castle of Monsieur the Baron von Thunder-ten-tronckh, there lived a young boy on whom nature had bestowed the gentlest of dispositions. Brought up in the household of a German Baron, Candide is an open-minded young man whose tutor, Pangloss, has instilled in him the belief, inspired by Leibniz, that ‘all is for the best in this, the best of all possible worlds’. But when his love for the Baron’s rosy-cheeked daughter is discovered, Candide is cast out to make his own fortune. As he and his various companions roam over the world, an outrageous series of disasters befall them – earthquakes, syphilis, a brush with the Inquisition, murder – sorely testing the young hero’s optimism. I thought I would share the first lines of one of the most bizarre adventures I have ever read. 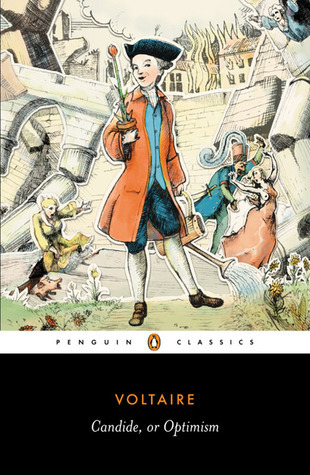 It has been several years since I read Candide but it still stands out in my memory, seeming to flow from one crazy scene to another. I can’t say I would recommend it for everyone, though it is considered a true classic. Check out the First Lines Fridays archive for more posts!